Reedsy was created with the purpose of allowing independent authors to work with some of the best editorial and design talent out there, and build long-lasting, fruitful collaborations. 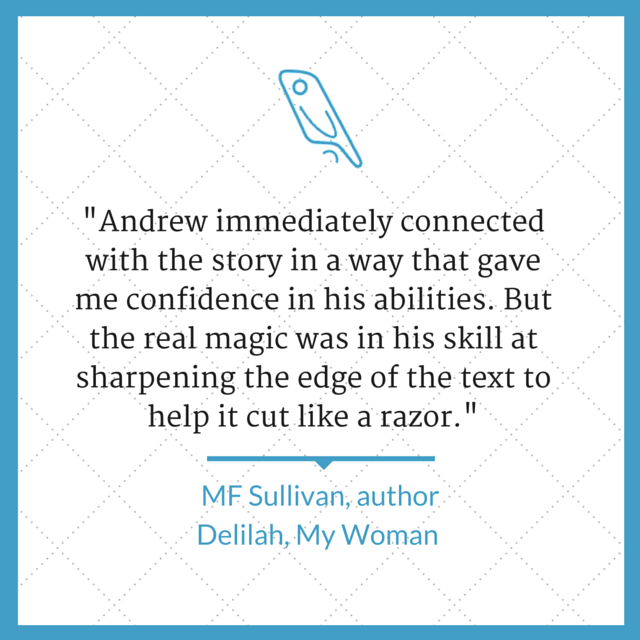 In this guest post, editor and novelist Andrew Lowe explains how self-publishing has transformed the author-editor connection into a powerful creative partnership. The object confusion has gone; it’s clear that the bag, not the amulet, is being hooked through Jim’s belt. It’s technically correct, but dead on the page. We’ve fine-tuned the mechanism of the sentence, but murdered it as a piece of flowing prose. A good editor – particularly in the case of fiction – understands that the work is a delicate balance of art and science and that sometimes one has to be sacrificed in favor of the other. In this example, I would keep the original sentence, arguing that the technical imperfection is secondary to the feel of the prose. Other editors might reach for our favorite mantra: never confuse the reader. But it would be fussy to argue that a reader, immersed in the wider narrative, would stop to ponder the amulet/bag question as presented here. 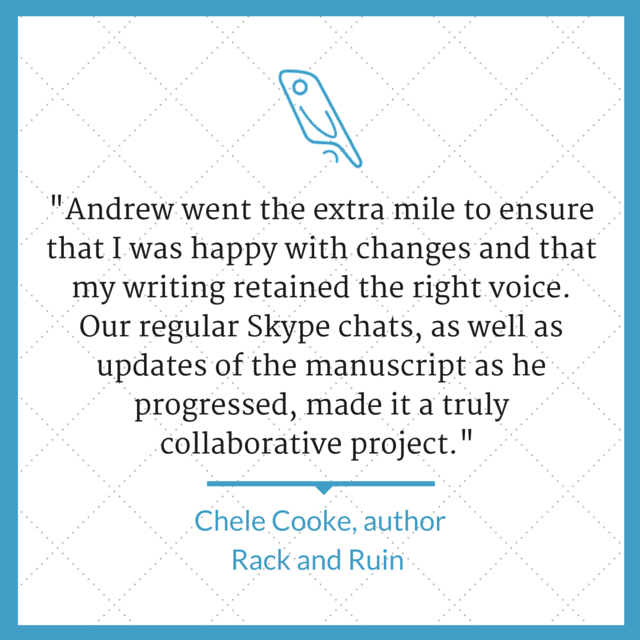 It’s a subjective judgment call which, for me, taps into the most important quality that authors should expect from your editor: a passion for collaboration. When you hire an editor, you are not giving over your precious darling to be defaced and remoulded. 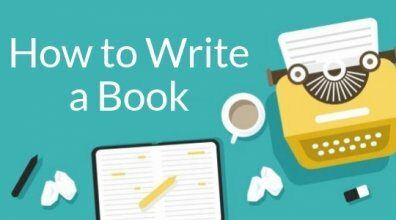 You’re paying for a professional eye; a sympathetic assistant who will work to a set of consistent criteria and help you to make your book as good as it possibly can be. Actually, let’s not. If you Google something like ‘book editing copy line structural’ (and you really shouldn’t) then you’ll soon be sucked into a swirl of fuzzy definitions and conflicting concepts. 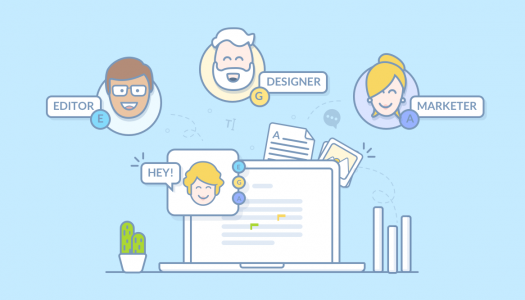 Like most creative disciplines in the digital age, the different types of book editing are ever-changing, mostly because of the connected and collaborative nature of online tools. I was a consumer journalist – mostly at editor level – for fifteen years, and I understand the need for specific publications to adhere to established rules. They face numerous copy-streams flowing in from hundreds of writers to be worked on by a multitude of sub-editors. A unified house style ensures that the task isn’t tethered to a single individual. Traditional book publishing has generally followed this model, for similar reasons. It is an industry and must operate at industrial scale, with hundreds of titles taking their place on a trusted and cost-effective production line. The editing process is often just another cog in this corporate machine. But the rise of self-publishing has presented an opportunity for the process to be more collaborative; to strengthen the relationship between author and editor. Because self-publishing does not mean ‘do it all yourself’. I believe that all the very best creatives – even those with a reputation as stand-alone auteurs – rely on some form of collaboration to realise their vision. The ‘self’ in self-publishing is more about self-empowerment. You make the decisions – including which editor is right for you. But an editor can now care about the work almost as much as the author. For me, this process of feeling invested in a book begins with a Skype call, where I’ll discuss the work. I like to listen to the author talk about why they wrote the book, what inspired it, what they’re trying to say, who they hope will read it. I recently worked with an author who had been sweating over her debut novel for seven years and was concerned about finding an editor who could click with the book at a deep enough level. It all built into a rich, mutual understanding of the work. The author felt supported, and I was able to approach the edit as both technician and creative. The trick is to hit the sweet spot between friendship and work. I find that a robust approach to crafting the book’s style sheet is the best way to keep focus on professionalism. Unlike that traditional model, where a large publishing house generally has to apply an infallible, top-down policy over, say, whether or not to use full stops to punctuate abbreviations, I can create the style DNA of a book as more of a consultation, informed by the author’s preferences. With this technical underlay in place, the author-editor relationship can go even further – even to the point where the creator/producer line blurs. In another book I worked on, I used Word’s ‘Track Changes’ feature to suggest alternative chapter headings – which the author could accept or reject. Happily, she accepted most of them, and was so pleased with the improvements that she hired me to rewrite the blurbs for all her other work. Her testimonial also shows how much she enjoyed the process. As I say in my Reedsy profile, I want to finish each job with the satisfaction that working with the author has improved my editing just as much as I’ve improved their writing. So, if you hire me, that’s how I like to work. It’s teamwork – systematic and measured, but also sympathetic and mutual. Collaborative copy-editing. 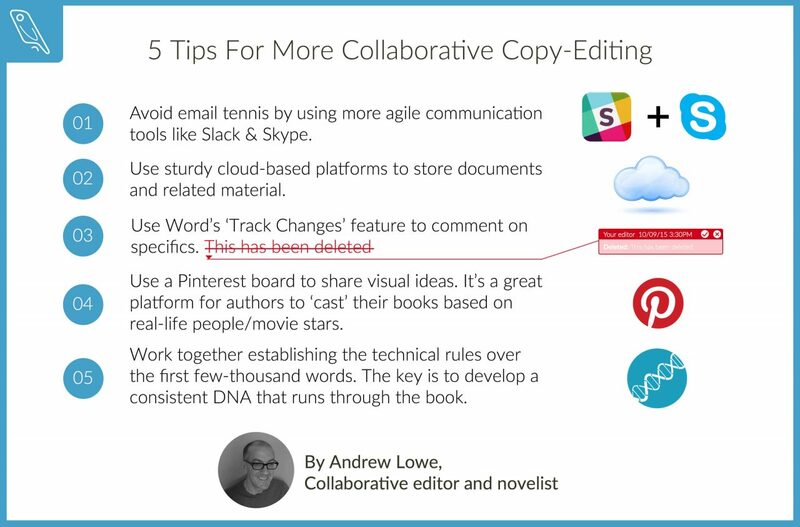 To finish this post, I'll leave you with 5 actionable tips to make the copy-editing process more collaborative! Avoid email tennis by using more agile communication tools like Slack – and Skype for when you need a broader discussion. Use sturdy cloud-based platforms to store documents and related material. Dropbox now offers a fantastic collaborative ‘badge’ which appears on all Word files, enabling author and editor to work on the same document without fear of version conflict. Use Word’s ‘Track Changes’ feature to comment on specifics. I’ve had many entertaining virtual conversations in the margins, and the result is always improved copy. Use a Pinterest board to share visual ideas. It’s a great platform for authors to ‘cast’ their books based on real-life people/movie stars. This makes it a lot easier for an editor to get closer to an author’s perspective on their characters. Work together establishing the technical rules over the first few thousand words. Points of style and grammar are often fluid, and no editor should force their own quirks and preferences onto an author. The key is to develop a consistent DNA that runs through the book and which both parties are 100% invested in. 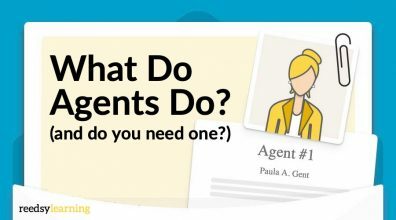 If you want to share these tips, tweet the image below by clicking on it! Want to learn more about copy editing, developmental editing and proofreading? Check out our book editing pages here! ← A Facebook Author Page, Still Worth It?